Probate isn't a one-size-fits-all process – the rules typically vary from state to state. Some jurisdictions allow executors to act with more autonomy than others. If a decedent leaves special instructions in his will, allowing his executor to act without court supervision, this usually overrides state law, even if supervision is normally required. 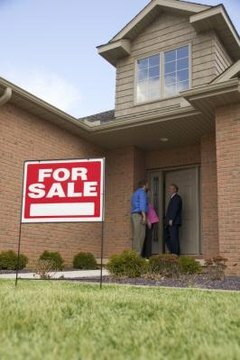 Selling property from the estate depends on all these variables, and sometimes a few more. An executor can't arbitrarily sell the decedent's property, but there are often some good reasons for her to do so. When a decedent leaves more debts than liquid assets, his executor may have to liquidate estate property to pay them off. She might also have to sell the decedent's property if his will says that three beneficiaries should each receive a third of his total estate, but his estate is made up of just one significant asset, such as real estate. The property would have to be liquidated so everyone receives their rightful share. Sometimes a decedent will foresee this problem and direct his executor to sell the asset to make the distribution. What Is an Executor's Sale? Probate is more painless in some states than in others. For example, if a decedent leaves a will, this typically qualifies his estate for an independent administration in Texas. Under an independent administration, his executor does not need authorization from the court to sell any of his assets. If he dies without a will, however, the probate court must approve all sales. If a decedent dies without a will in Louisiana, the executor needs the consent of his heirs before she can liquidate property. In many other jurisdictions, the executor must petition the court for permission to sell property under any circumstances. Some states make a distinction between different types of property. For example, although Georgia requires that an executor get court permission before selling property, the state waives this rule if she must sell stocks or bonds. One caveat exists, however -- the executor cannot sell these assets for less than the stock exchange price or bid price in effect at the time of the transaction. Permission to sell property usually involves petitioning the court before the asset is even marketed, and the court may not grant approval until a statutory period of time has passed for heirs and beneficiaries to object. Some states, such as Louisiana, also require that the executor publish a notice of the request in the newspaper. In Texas, any contract for sale must include language that the transaction is contingent upon court approval. Bird, Beverly. "Does the Executor Have to Get Permission From the Courts to Sell the Property of the Deceased?" , https://legalbeagle.com/12331710-executor-permission-courts-sell-property-deceased.html. Accessed 25 April 2019.